"Language is to the mind more than light is to the eye." 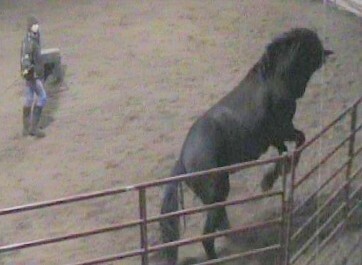 Stallion performing terra-terra, upon request of Cassandra Snyder. "Horse, please come to me quickly, with much energy." He answers by trotting right up. "Please stop and take all the energy in which you came towards me, and re-center your energy into a holding; a harnessing of your strength and power." He stops and redirects his energy rearward, thus creating collection and elevation of his forehand. His facial expression shows pride in his power and obedience, and softness is in his eyes due to his understanding. The effort the stallion is putting out to do as I ask is tremendous! He is performing terra-terra, a classical haute-ecole maneuver. Haute Ecole is French for High School. High School consists of "Airs Above the Ground" and is the level of Dressage training beyond Grand Prix. Grand Prix is the Olympic level of competition. Terra-terra is a posture which is a precursor to the pinnacle of collection; the movement named the Levade. When this stallion becomes stronger, he will be able to further lower his croup and flex his hocks to a greater degree, thus fulfilling the requirements of the levade. Horses need not be a Lipizzaner, or a breed of Baroque descent, or a Warmblood, or anything in particular to execute "collection" in extra-ordinary ways. Troubled horses need extra-ordinary communication also. Rehabilitation, healing, and transformation is what I offer. The formerly aggressive horses are now productive and gentle animals. I believe it is abnormal for a horse to be vicious. This is a behavior which is a product of their history. Healing the soul of the horse is as necessary as healing muscles and tendons. Healing the soul of the horse is often overlooked until a radical event occurs, thus bringing attention to the damaged psyche of the horse. The horses displaying the problems of lesser emotional intensity and risk, have also been healed, rehabilitated, and transformed into useful and productive horses. The following are photos from a session with a Friesian mare. She had broken the hand of her farrier, savagely bitten her groom, and had not been successfully ridden. Using The Sacred Language to talk with her, I have convinced her I am trustworthy, and respectable. She now wants to please me. I have classified, structured, and labeled my methodology in order to teach my once "secret" language to these troubled horses' owners. I chose the name: The Sacred Language, in order to convey the limitless spiritual power of having a language available to talk with your horse. 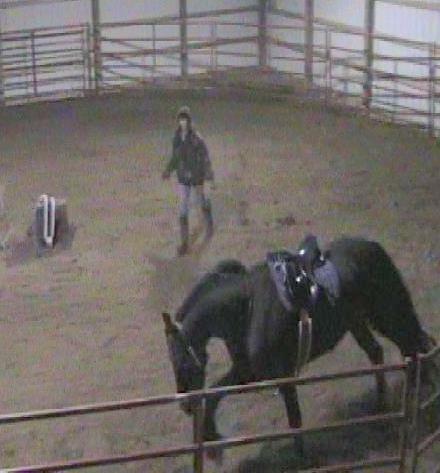 First know that I cannot count the number of times people have exclaimed: "This is not how other trainers use the round pen! You're not just chasing them around in a circle to get them tired!" I say this to indicate I do not label my methods under the heading Natural Horsemanship. I help those who have already tried Natural Horsemanship, and still have a need. The Sacred Language is not Alpha-mare based, nor predator/prey based. I believe both approaches are too commanding and frightening, and are often the very reason behind an aggressive horse's actions. Many Natural Horsemanship methods provoke a horse's fear aggression, or add to the horse's anxiety. Instead of dominating a prey animal, I show the horse my intent to respect the horse; my intent to honor the horse. Horses know when they are being respected and honored, and they know when someone is trying to intimidate and frighten them. A fear based relationship is not very rewarding to most owners, but there is a prevalence of fear-based clinicians and 'training' methods and tools. I am working to expose horse owners to a kind, gentle, and authentically powerful method of horse handling where the horse can let down its guard and become a follower of your lead. A horse can then feel emotions of love and trust, with no need to be on guard, or high-alert. The Sacred Language is based upon an instinctual need of the horse to be protected. Horses are socially and emotionally well-developed herd and prey animals, with an interactive way of living together. Strong bonds exist for their survival. I utilize these instinctual bonds for our benefit. I use the existence of these inherent bonds to adhere horses to me. I teach all who want to learn, how they too can have this loving union. Diamond and his owner, Cynthia. When first purchased, Diamond was so frightened, he would not allow himself to be touched. After communicating using The Sacred Language, Diamond trusts Cynthia. 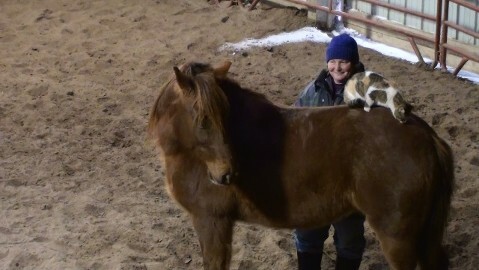 He stands with her as she pets him, and even as a barn cat jumps onto his back. Congratulations Cynthia for your accomplishments! Teaching a horse's owner the nuances of equine body language, behaviors, mannerisms, instincts, and boundaries gives the horse's handler all communication skills needed in order to maintain the new and glorious relationship I helped to create. I show how they too, can earn, then protect, the heart of their horse. The utilization of this language makes horses...well, happy, is the best way to sum it up. Emily, a teen-aged student of mine (please read her story in the page titled Success Stories) frequently receives compliments on her Morgan mare. Once a tense, nervous, and spooky horse, Dee is now being called: "Bright eyed and relaxed." Descriptive words befitting a relaxed, confident, happy and healthy horse. Courses in The Sacred Language provide horse owners an answer to all situations; a thorough understanding of the ways of the horse, thus resolving potential frustration, preventing injury, and creating a soul-full union of two different species. Everything learned during these courses in The Sacred Language is also used when relating to a horse under-saddle, for the same clarity of understanding as when on the ground. The Sacred Language is a primer for subtle, gentle, and authentically powerful communication in the saddle, thus providing a most rewarding relationship and safe relationship once mounted. The Sacred Language (for curious behaviorists) is a primary and positive reinforcement method of communication and interactive language. I feel horses should have an incentive to work for us; an incentive greater than the mere removal of pressure/pain. I do not believe the removal of something negative is a reward. I also don't care for using food as a reward. Although clicker training (operant conditioning) is a tremendous leap forward for the humane treatment of horses, and has its place in the world of behavior shaping, I do not feel it has the capacity to provide the horse the feeling of peace, protection, devotion, and nurturing love that The Sacred Language can provide. When you can speak The Sacred Language, you are better than any food reward provided in the operant conditioning approach. With the every day usage of The Sacred Language to communicate with your horse, your horse's eyes will become liquid soft, as they know they are protected, and their every thought and action will be performed in total understanding of your requests, and your horse will be relaxed. The emotional state of euphoric contentedness becomes your horse's normal way to feel. You don't have to have a dangerous horse to come here. All horses are welcome. Since dangerous horses are transformed into loving partners, of course we can do great things for your already good relationship too! 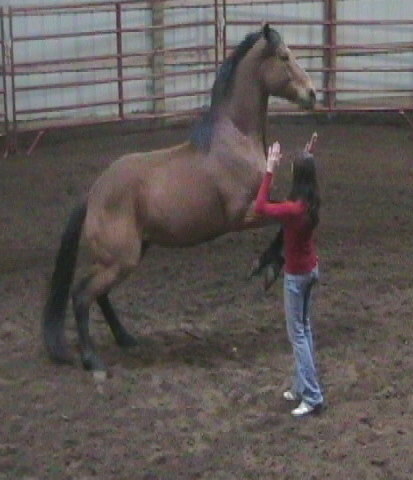 By learning how to use your body as an instrument of communication, you can show your horse what you want it to do. And, most importantly, you show your horse your intentions to protect it, be its friend, and its leader. Endless are the possibilities for your connection with your horse. From haute ecole, to leisurely, safe trail riding...whatever your riding goals are, I will be honored to help create a precious union between you and your horse.